We are excited to announce that the second call for scientists to take part in Soapbox Science’s Art & Science collaborative project is NOW OPEN! In addition to our usual events, Soapbox Science’s 8th year is set to bring innovative, awe-inspiring, and mind-boggling science to arts festivals around the UK. Thanks to continued funding from STFC (Science and Technology Facilities Council), Soapbox Art & Science embarks on its second year of uniting female scientists with artists from local research/education institutions to explore fresh and engaging ways of communicating scientific ideas through art, and testing them out on audiences at arts festivals. Are you a female scientist who is passionate about your work, and eager to explore your topic in creative ways? If so, then Soapbox Art & Science needs YOU! We are looking for active scientists in all areas of science, from PhD students to Professors, and from entry-level researchers to entrepreneurs, to take part in this cutting-edge project. Any area of science can inspire art: from string theory to laser technology to elephant behaviour! And artistic approaches can provide new, fresh ways to explain science to a non-specialist audience. 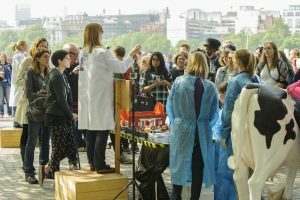 Soapbox Science is a grass-roots science event that brings science to the masses, and tackles inequality issues in science. Female scientists stand on soapboxes on busy urban streets and chat with the public about their work. 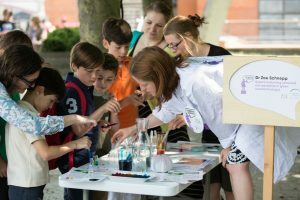 Our Art & Science events will match scientists with artists (from a variety of disciplines); the pairs work together to produce a new, innovative and engaging way to help communicate their science, which they then co-present at an Arts Festival. We are a non-profit initiative who runs free science engagement events, and so sadly we are unable to pay artists and scientists for their time. We are mindful of the financial and time pressures experienced by many artists and scientists, and therefore it is not essential that new art work is produced for these specific events. Moreover, time commitments are decided by the artists & scientists themselves, depending on what they are able to offer. Why should you apply to be a Soapbox Art & Science scientist? What other benefits will you gain from taking part? We can match you with a local artist with similar interests, or if you are already working with an artist, you can apply together. You will need to be available for a workshop in the second half of January (for Perth, Cambridge and Manchester) and first half of February (for Bournemouth, Plymouth and Lincolnshire) as well as one afternoon at the festival you choose to participate in. The deadline for applications is 08/01/18 and we will be in touch at the beginning of the week starting on 08/01/18.